Jakob Gijsbert "Jaap" de Hoop Scheffer is a retired Dutch politician and diplomat of the Christian Democratic Appeal (CDA). He served as the 11th Secretary General of NATO from 5 January 2004 until 1 August 2009. On 22 June 2018, he was granted the honorary title of Minister of State. General Hastings Lionel Ismay, 1st Baron Ismay, nicknamed Pug, was a British Indian Army officer and diplomat, remembered primarily for his role as Winston Churchill's chief military assistant during the Second World War and his service as the first Secretary General of NATO from 1952 to 1957. Edmund P. Giambastiani Jr. is a retired United States Navy admiral who served as the seventh Vice Chairman of the Joint Chiefs of Staff from 2005 to 2007. He retired in 2007, after 37 years of service. David Charles Jones was a United States Air Force general and the ninth Chairman of the Joint Chiefs of Staff. Bernard Rudolf "Ben" Bot is a retired Dutch politician and diplomat of the Christian Democratic Appeal (CDA). 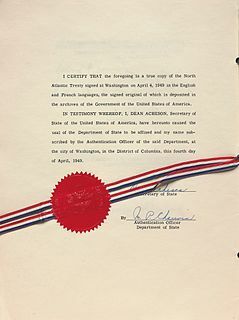 The NATO Standardization Office (NSO) was a NATO agency created in 1951 to handle standardization activities for NATO. The NSA was formed through the merger of the Military Agency for Standardization and the Office for NATO Standardization. 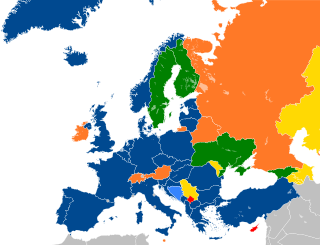 During the Agency Reforms, the NSA was transformed to the NATO Standardization Office (NSO) on 1 July 2014, headed by the Director of the NATO Standardization Office (DNSO).